The recent outbreak of a new strain of swine flu in Mexico that has spread internationally is caused by human infection of a new variety of influenza virus A, H1N1, and is reported to be of swine origin. Because the influenza pandemic of 1918 which killed twenty to forty million people was known as swine flu, Spanish flu, and the Blue Death, many associate it with this new strain. Pigs can carry several kinds of viruses at the same time including bird, swine, and human influenza, so new recombinant strains from swine can include attributes from several sources. The US Centers for Disease Control and Prevention reports that this swine flu strain is susceptible to the prescription antiviral drugs oseltamivir and zanamivir. Over 1,600 people are believed to now be infected in Mexico alone and the international count rises daily. The World Health Organization warns that swine flu has now surpassed our ability to make containment feasible. While it is believed that in Mexico nearly 160 individuals have died from swine flu complications, fewer than ten cases have been confirmed. In the United States it is believed that over one hundred infections have taken place with one confirmed fatality. The swine flu is a respiratory illness caused by infection of the Influenza A virus H1N1, which is of the orthomyxovirus family. Infected individuals usually experience a rapid onset of flu symptoms which typically include: muscle aches, high fever, headache, chills, fatigue, dry cough and runny/stuffy nose. Symptoms begin within 48 hours of infection and generally occur suddenly; recovery from the primary infection may take up to two weeks. Complications can involve secondary infections such as life-threatening bacterial pneumonia or pneumonia caused by the Influenza virus itself. Reports estimate that annually five to twenty percent of the population of the United States becomes infected with the various varieties of the flu with over 35,000 deaths related to complications each year. Influenza viruses, including the swine flu, are found in body fluids such as saliva and mucous and commonly transmitted via tiny, air-borne droplets created through sneezing and coughing. 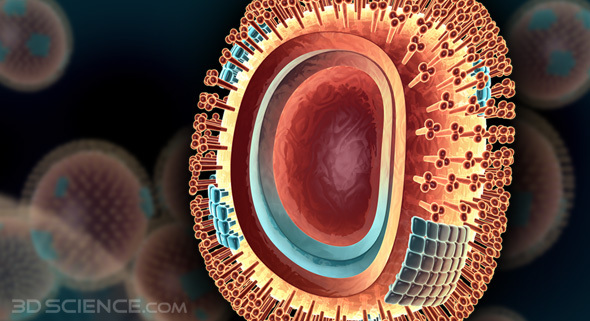 Depending on the conditions and temperature of the environment, the Influenza virus can remain infectious for up to one month. Transmission occurs as a new host comes into contact with viruses dispersed into the air or onto surfaces of objects. Covering coughs and sneezes with a tissue, and washing surfaces and hands greatly inhibits transmission. Infection occurs as viruses attack host organisms through epithelial cells of the nose, throat and respiratory system – not through gastrointestinal system by the consumption of infected food (such as pork). Glycoproteins in the surface membrane of the virus bind with specific proteins of the epithelial cells, leading to endocytosis of the virus. 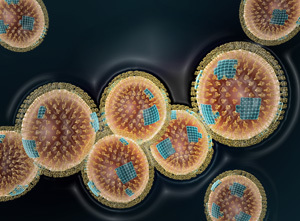 Within the host cell, the viral RNA and associated transcription components are released into the cell causing replication of the virus and symptoms in the host organism. The common cold (acute viral nasopharyngitis) is not caused by the Influenza virus, but it is often confused with the flu because it does share similar symptoms such as: fatigue, cough, headache and runny nose. Yet differing symptoms of the cold are: sore throat; productive, phlegmy coughs; and sneezing.